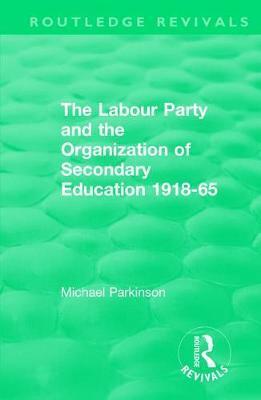 Originally published in 1970, Michael Parkinson examines the Labour Party's attitude towards secondary education in general and comprehensive schooling in particular and shows the effect of the party's philosophy on the question of education and its social importance. The Labour Party is seen both as a policy-maker with the power to implement policies and as a pressure group with power only to influence. The case study provides valuable background reading to the controversies over comprehensive education at the time. General Editor's Introduction. 1. Introduction 2. Secondary Education for All, 1918-44 3. The Labour Government 1945-51 4. Selection and Segregation in English Secondary Education 5. The Labour Party and the Comprehensive School, 1951-65 6. Labour and Private Education 7. Conclusion. Suggestions for Further Reading. Bibliography.